Texas A&M University-Kingsville Anonymous Texas A&M-Kingsville group recognize staff members as "Bringers of Light"
Anonymous Texas A&M-Kingsville group recognize staff members as "Bringers of Light"
Texas A&M University-Kingsville staff members Jason Marton, assistant director of marketing, and Yolanda Ballard, assistant director of administration for the Caesar Kleberg Wildlife Research Institute, were named “Bringers of Light” by the campus group, Servants of Las Luminarias. Ballard first saw the flowers on her desk, then the luminaria and plaque. Her co-workers tried to understand how it had all been placed in the office without anyone getting caught. “I was surprised and excited to receive the award,” Ballard said. Ballard has worked at A&M-Kingsville for 32 years, and all of that time has been with the Caesar Kleberg Wildlife Research Institute (CKWRI). Ballard began as a part-time student worker, helping process a mass mail-out of annual reports; she would earn a B.B.A. in Marketing from then-Texas A&I University in 1985. 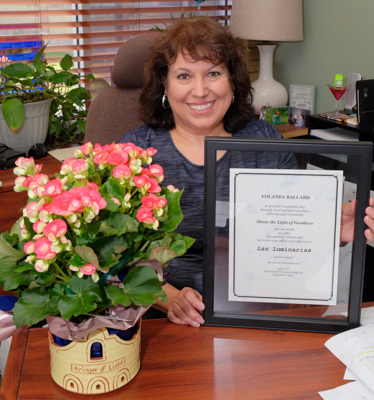 After graduation, she earned a part-time secretary position, and went on a host of different positions at the institute, including Accounting Clerk, Word Processor Operator, Administrative Assistant and Office Manager, before being named Assistant Director-CKWRI Administration. The Freer native found more than a career at the CKWRI—she met her husband Dr. Bart Ballard there. Bart Ballard is a professor and the C. Berdon & Rolanette Lawrence Endowed Chair in Waterfowl Research. Yolanda describes Bart as her “best friend and partner for over 25 years.” The two have a son, Derek, who is currently attending Iowa State University pursuing a master’s degree in wildlife ecology. Marton knew all about the Bringer of Light award he found in his office one morning. “I’ve been lucky enough to write news releases for the last 14 years about the previous Bringer of Light winners, meeting some of the best people on campus in the process. I have a lot of respect for the award,” he said. Marton first came to Texas A&M-Kingsville and its then-Office of Public Affairs in 2003. He left in 2008 for a few months to pursue some freelance opportunities, but came back to the university full-time in 2009 and has been here ever since. 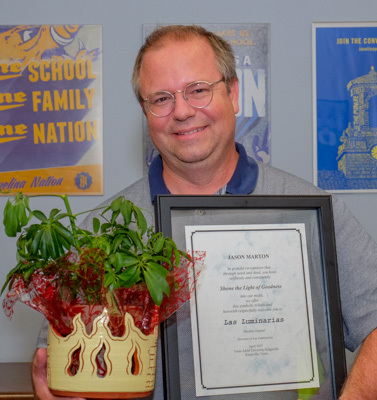 Prior to A&M-Kingsville, Marton was an announcer and program director at KEDT-FM, South Texas Public Radio in Corpus Christi. “The communication skills I earned there were a great fit for the university; it’s been a bonus that A&M-Kingsville and KEDT-FM have joint projects I’ve been a part of through the years,” he added. Marton was born into a military family in San Antonio and raised in Aransas Pass. “I’ve lived in Rockport for the last 18 years raising my own family with my amazing wife Nicole. We have a son, Max, who’s a year away from attending college and a daughter, Samantha, living and working in Austin. We have been blessed to have my parents and my wife’s parents within 10 miles of us, so my kids have always had grandparents in their lives, and my wife and I have had our parents to share life experiences with, which is the best.